At the end of April, which happens to be the best time with the Judas trees blossoming everywhere, we spent a Saturday in and out of many holes trying to discover a hidden part of historical Istanbul. It was a trip arranged by Tur Kosmos with Vera Bulgurlu, Ferudun Özgümüş and Hayri Yılmaz as our guides. The goal was to see the Roman/Byzantine remains of the city from the remains hidden under post 1950’s structures. Most of the places we would be visiting were discovered by Dr Özgümüş and Dr Yılmaz in the last decade. 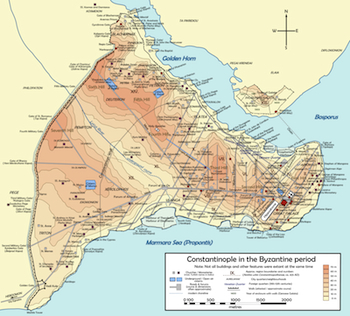 What they did was examine maps of Byzantium for places of importance, determine their current locations and began knocking on doors one by one and asking people if there was anything interesting in their cellars! Dr Özgümüş said his insistance sometimes meant that he was chased away by furious owners who were worried that findings beneath their buildings meant they would be confiscated or torn down. We witnessed some of the frustration of the owners of the modern buildings: we were not permitted to see some of the locations after the owners had changed their minds about showing others what was hidden beneath the modern structures. The tour began and ended at Levent which was a convenient location for us, however it would have been better to start from Taksim and change the course a bit, as it was intended to be, so that we would begin with the dumps and move to more spectacular locations. However due to time restrictions we began with foundation hidden under the old Cibali Cigarette Factory which is Kadir Has University today (see the place marked with A above). Though a bit off our topic we spent a short time examining the artifacts in the small Rezan Has Museum under the university. This exhibition area leads to some stairs at the end which is the entrance to a (possibly) 11th century cistern which is slowly being excavated. I remember coming to this location 6-7 years ago and it was only a few chambers back then. Now after taking out more earth, mud and other debris; this has become a cold cellar of connected rooms with a few Corinthian columns which hint that the actual depth is at least 4-5 meters more and we were still standing on centuries of mud. 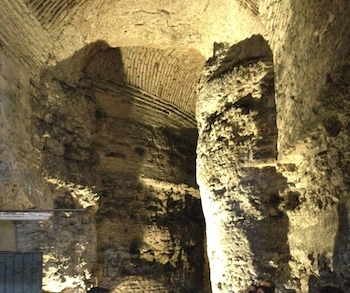 Before we go deeper into ancient cisterns it’s good to know why there are so many of them beneath Istanbul. There are 2 main reasons: first and most important, Istanbul (Byzantium, Constantinople) has always been a city desired by many and it lacked water resources way before it became a city of 15 million. So the Romans who were brilliant engineers built aqueducts to bring the water from sources away from the city. We can still see the Valens Aqueduct in the middle of the city built by Hadrian and redone by Valens and the Ottomans. Water brought in by aqueducts (which were in total about 250 km long at one point) were stored in three open and more than a hundred underground cisterns all over the city. During sieges this stored water would help the city survive while the army outside did not have enough water to sustain the siege. The other reason for the aqueducts was that the city is hilly and Romans being Romans, they were fond of long straight streets. So in order to create such streets and forums (agoras or squares) they flattened hilly places and canyons by building structures that were also used as cisterns under the roads and squares. Our second stop (marked B in the map above) was another cistern in very good shape. The Pantrokrator Cistern is beneath the Church of the Pantokrator (aka Zeyrek Kilise Camii) right next to the road that crosses the Golden Horn over Unkapani Bridge towards the Valens (Bozdoğan) Aqueduct. It’s currently under restoration but we were able to go in and take a peek. It’s also possible to go up the stairs to the top where the water was overflowed to clean it into the galleries above. 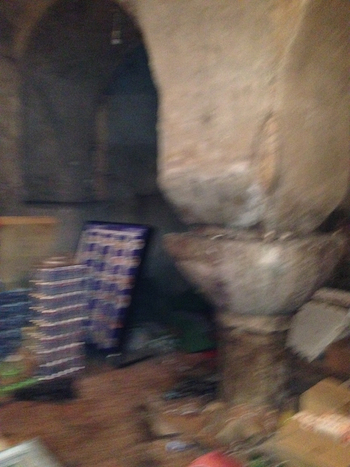 There used to be a mosque above the cistern which no longer exists but for two old tombs and part of the altar. For our third stop we had to take our bus again and ride it for about 20 minutes to Samatya (Ypsomatheia). (Marked C in the map above.) When we stopped outside a sleepy beer drinking establishment we had no idea that we were going into the unmarked blue door under a Greek Orthodox Church (Agia Menas, known in Turkish as Aya Mina). This unmarked iron door led us into an ironsmith. We walked between metal car parts being mended and through another door. We ended up in a circular room which apparently was a martyrion for St. Policarpos. The 6th century church was recently cleaned after various visits here by curious Istanbulites and the ironmongers also added some lighting so it’s possible to barely see the writing above in Greek and the remains of a fresco of St. George slaying the dragon. Dr Bulgurlu told us she was able to read the writing only three weeks ago and from that it’s almost certain that the place was dedicated to St. Polycarpos who was a saint from Izmir (Symryna, where a church devoted to the saint exists right beside Izmir Hilton and Efes Hotel). Next, Dr Özgümüş told us we’d see the “tunnel” where the pious visitors would use to circambulate praying for St. Polycarpos’s soul. We left the iron monger and entered into the coffeeshop next door. Walking between tables with old men playing cards and betting on horses while sipping tea we got into a small corridor that led to the circular tunnel. The ground was full of junk and mud and carefully we walked around the martyrion pilgrim style until the part where the passage was blocked. Soon To Be A Winehouse? Here they told us the coffeeshop owner had sold his store to someone who was planning to clean the place and turn it into a winehouse. It sure is a good atmosphere for one but seemed a bit far fetched as an idea at this point. Plus a martyrion turned into a winehouse does not seem like a good fit to me, but we’ll see how things work. 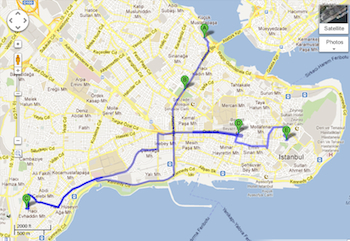 We got on the bus again and ventured into the traffic towards Beyazıt (marked with D in the map above). Along the way Dr. Hayri Yılmaz told us about the watertight plaster that the Romans used to construct the cisterns (no there was no eggwhites involved, it would take more than the total number of chicken in antiquity to get so many egg whites) and about the mosques built by Sultan Mustafa III which were called by other names that he (the Sultan) did not approve of. Where we stood (Ordu Street) was one of the main streets of Byzantium called The Mese. The Mese began in front of Hagia Sophia where the milion stone marks the beginning of the road from Constantinople to Rome. It lead to Çemberlitaş (Forum of Constantine) and diverged around today’s Beyazıt Square (Forum Tauri later known as Forum of Theodosius). The northern arm ends in Edirnekapi and the southern arm ends in Belgrad Gate or Yenikapı where the Golden Gate was. This street was 25 meters wide and was used as the ceremonial street since the Roman times. Dr Özgümüş showed us some remaining columns used to make the porticoes of the shops around the street lying right there in front of Istanbul University. The reason I’m giving you all this encyclopaedic information is to tell you the importance of this street which was built nice and flat over a hilly city with huge squares (sometimes oval) using foundations that were also used as cisterns. This part of the day we spent going under extremely ugly and sometimes illegal buildings built on these cisterns to see them and try to imagine what they might be like when they were built about 1500 years ago. We began in a narrow street across from Istanbul University School of Literature (marked C in the map above) and observed an ugly modern building used as a shopping mall selling textiles. We went around the building got inside the corridors with shops went down the stairs through another corridor and out. Now we were looking at the makeshift foundation of the shopping mall which was built over an ancient cistern. The cistern was used a dump for years and after some cleaning it was still full of broken glass, pieces of cement and tiles, a plastic boot, newspapers and other junk one can see in an empty lot of any ever changing Turkish city. 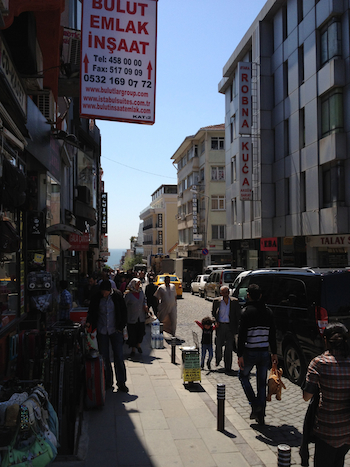 We moved on towards St.Sophia and tuned right towards the sea into another crowded street. We saw the building we could not get permission to visit from the outside: just another 4 storey ugly 60’s building with a huge cistern under it. Do You See Anything Interesting Here? Next stop was Antik Hotel, a better example where the cistern was restored in a tacky way and was used as a restaurant and a bar. Another was a building called Kafar Han which housed a 6th century cistern with a column head that had the engraved initials (in Greek) of the maker. The cistern was filled with centuries of junk and the ground was later covered with some ceramics. Dr. Ozgumus told us that the cistern was used as a depot of plastic slippers for a long time. 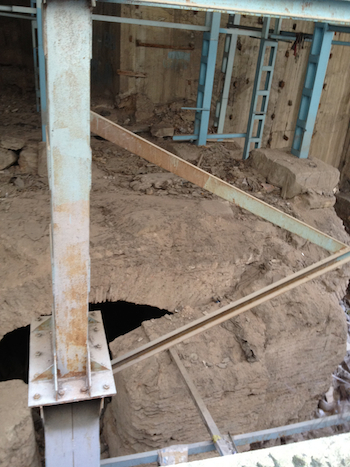 We were also able to peek into another structure further down, possibly a religious structure. We climbed back up to the street level trying not to step on bones of a chicken kebab left in the corner and slip back into history. The sight was not appetising but it was nevertheless time for lunch at Sarnic Restaurant behind St.Sophia keeping with our theme of being underground the whole day. 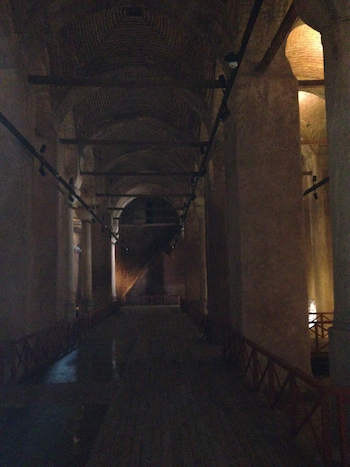 After lunch we stopped by Theodosius Cistern (Şerefiye Sarnıcı), another huge cistern that was opened for us (even though Wikipedia says that it is open to public, you have to give someone a prior notice to be able to see it). Right above it is a very nice building that is partly damaged due to a fire which might be the old conservatoire of music. The cistern is remarkable but not much is known about it except that it might be connected to the other major cisterns here (Binbirdirek and Yerebatan) which is remarkable. We moved on towards Sultanahmet and stopped by a souvenir shop right behind The Blue Mosque (known in Turkish as Sultanahmet Camii). Here was an in situ column, possibly one of those that are built to support The Great Palace of Constantinople. This part of the tour was in my humble opinion the most interesting part. Dr. Özgümüş told us about the Great Palace, that it was partially funded by a Persian nobleman on exile which explains the open courtyards and connected pavillons (very similar to and possibly the inspiration for Topkapi Palace) and as we spoke we walked into a parking lot used by the tourist buses that shuttle tourists in and out of the ancient peninsula. Here were were greeted by a strange parking lot keeper who claimed that he was a nutcase and that was the only way he could stand his job which he detested. Ignoring his remarks that he would charge us a lot more next time we came, we walked into the dusty parking lot towards a hole in the ground hidden behind some parked vehicles. After we put on our head torches, we slowly climbed down some old stone stairs into utter darkness, into a sloping tunnel. As usual, we stepped on all sorts of junk and the short tunnel ended in a room where we could stand up properly. From here, we went down another slope on the left for a few meters into a huge room. This apparently was one of the rooms used as a dungeon of the Great Palace. At the same time, it served as the foundation because the palace was built on the slope towards the Marmara Sea. When you look at the map of the palace, it’s possible to see many terraces, each one getting lower as the 19.000 square-meter palace gets closer to the sea walls. It is believed that this little chamber that we crawled into is actually connected with similar ones all the way to Hagia Sophia! In this case the chamber ends with dirt that probably fell in during one of the many earthquakes that still dangle over Istanbul like the sword of Damocles. I could not help thinking how great it would be if someone one day clears away centuries of earth and actually connects these ancient buildings as they were years ago. After all this palace served as the imperial palace for 800 years until the Byzantine rules decided to move to the other side of the city very much like the blind people of Chalcedon due to reasons unknown today. According to legend it was in this palace that the greatest of the Ottoman Sultans, Mehmed II recited the Persian poem by Ferdowsi (“The spider spins his web in the Palace of the Caesars, An owl hoots in the towers of Afrasiyab”) as he strolled through the remains of the empire he took over. With these thoughts on my mind, we moved on to a travel agent in the crisscrossing streets behind The Blue Mosque (marked D in the map at the top of the page). Walking between the desks of the agents busy on a Saturday afternoon we reached the stairs that led us down to a Byzantine Ayazma (holy spring). We could hardly see the shadow of a fresco of Virgin Mary above the little crevice that covered the pooling water. 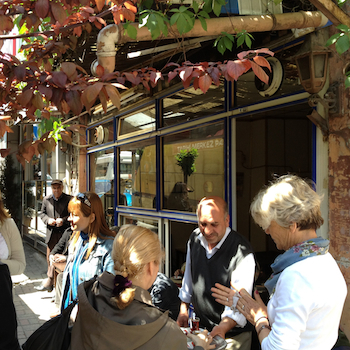 We thanked the travel agents and moved on to a cafe next to the Four Seasons Hotel (Sultanahmet). Here the owners were kind enough of excavate the cellar they found beneath their building and open it to public. It’s very nicely kept and well lit with a small piece of writing that explains how difficult it was to bring the connected 3-4 rooms to the current state. Dr. Özgümüş told us that there were also remains of an old bath here, not very common for Byzantine buildings that are found in Istanbul. And here we concluded our tour which left us dead tired. We hardly got to the old hammam built by Sinan the Architect for his mother in law Hürrem Sultan (Roxalena) across from Hagia Sophia that was renovated a year ago and is an excellent place to rest after a days hard walking. This entry was posted in GEZİLER, Türkiye and tagged Archeology, History, In English, Istanbul by sarapci. Bookmark the permalink. Can’t wait to experience and explore these hidden treasures! After we take a tour in Chora and Great School of the Nation in Fener. Didem: Çok teşekkürler. Öteki turlar kadar popüler değil tabii ama yapıyorlar, zaten kendi kendine yapman imkansız sayılır. Çok güzeldi bu yazı. Tur Kosmos’u da aradım, arada o tip turlar düzenliyorlarmış. Haberdar edecekler. Yaşasın.